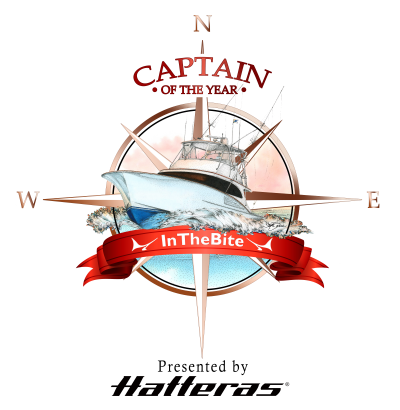 The InTheBite Captain of the Year Cup presented by Hatteras is the world’s foremost competition for professional sportfishermen. The world’s only quantifiable metric for comparing the tournament success of captains, winning an InTheBite Captain of the Year Award is a major achievement. The Cup is composed of five divisions that span the sportfishing world: East Coast, Florida, Gulf Coast, Hawaii and International. It is comprised of 90-sanctioned tournaments. The SCORING SYSTEM is: 1st Place: 500 points, 2nd Place: 300 points, 3rd Place: 100 points. Heaviest Marlin: 500 points. Overall Championship: 250 points. 12 Boat Tournament Minimum for points. Edisto Invitational Billfish Tournament, 1st Place, 500 Pts. SC Governor’s Cup Series Winner, 250 Pts. Hatteras Village Offshore Open, Largest Marlin 690.4 lbs, 500 Pts. Megadock Billfishing Tournament, 2nd Place, 300 Pts. Edisto Invitational Billfish Tournament, Heaviest Marlin, 500 Pts. The MidAtlantic, 1st Place, 500 Pts. Edisto Invitational Billfish Tournament, 3rd Place, 100 Pts. Virginia Beach Billfish Tournament, 1st Place, 500 Pts. The Big Rock, 1st Place, 500 Pts. The Big Rock, Heaviest Marlin, 500 Pts. Megadock Billfishing Tournament, 1st Place, 500 Pts. White Marlin Open, Heaviest Marlin 83-pounds, 500 Pts. Alice Kelly Memorial Ladies Tournament, 1st Place, 500 Pts. Pirate’s Cove Billfish Tournament, 1st Place, 500 Pts. The MidAtlantic, Heaviest White Marlin 79 lbs., 500 Pts. Ocean City Marlin Club Labor Day Tournament, 1st Place, 500 Pts. Megadock Billfishing Tournament, 3rd Place, 100 Pts. Edisto Invitational Billfish Tournament, 2nd Place, 300 Pts. Virginia Beach Billfish Tournament, 2nd Place, 300 Pts. The Big Rock, 2nd Place, 300 Pts. Alice Kelly Memorial Ladies Tournament, 2nd Place, 300 Pts. Ocean City Marlin Club Labor Day Tournament, 2nd Place, 300 Pts. The Big Rock, 3rd Place, 100 Pts. Alice Kelly Memorial Ladies Tournament, 3rd Place, 100 Pts. Pirate’s Cove Billfish Tournament, 3rd Place, 100 Pts. Ocean City Marlin Club Labor Day Tournament, 3rd Place, 100 Pts. Los Cabos Billfish Tournament, 2nd Place, 300 Pts. Bisbee’s Black & Blue Tournament, 1st Place, 500 Pts. Bisbee’s Los Cabos Offshore Tournament, 3rd Place, 100 Pts. Marina Casa de Campo Open, 2nd Place, 300 Pts. Abaco Diamond Series Champion, 250 Pts. Bermuda Triple Crown, 250 Pts. Los Sueños Signature Series, Leg 2, 1st Place, 500 Pts. Production vs. Custom Shootout, 3rd Place, 100 Pts. Abaco Beach Blue Marlin Tournament, 3rd Place, 100 Pts. Bisbee’s Los Cabos Offshore Tournament, 1st Place, 500 Pts. Los Sueños Signature Series, Leg 2, 300 Pts. Los Sueños Signature Series Winner, 250 Pts. Los Sueños Signature Series, Leg 1, 1st Place, 500 Pts. Los Sueños Signature Series, Leg 3, 1st Place, 500 Pts. Production vs. Custom Shootout, 1st Place, 500 Pts. Abaco Beach Blue Marlin Tournament, Heaviest Marlin 603 lbs., 500 Pts. Bisbee’s Los Cabos Offshore, Heaviest Marlin (522 lb blue), 500 Pts. Los Cabos Billfish Tournament, Heaviest Marlin, 499 lb blue. 500 Pts. International Billfish Tournament of Club Náutico de San Juan, 1st Place, 500 Pts. Bisbee’s Black & Blue Tournament, Heaviest Marlin 510 lbs, 500 Pts. Los Sueños Signature Series, Leg 1, 2nd Place, 300 Pts. Production vs. Custom Shootout, 2nd Place, 300 Pts. Bisbee’s East Cape Offshore Tournament, 2nd Place, 300 Pts. International Billfish Tournament of Club Náutico de San Juan, 2nd Place, 300 Pts. Bisbee’s Black & Blue Tournament, 2nd Place, 300 Pts. Aruban Caribbean Cup, 2nd Place, 300 Pts. Bisbee’s Los Cabos Offshore Tournament, 2nd Place, 300 Pts. Los Sueños Signature Series, Leg 1, 3rd Place, 100 Pts. Marina Casa de Campo, 3rd Place, 100 Pts. Los Sueños Signature Series, Leg 2, 3rd Place, 100 Pts. Los Sueños Signature Series, Leg 3, 3rd Place, 100 Pts. International Billfish Tournament of Club Náutico de San Juan, 3rd Place, 100 Pts. Bisbee’s Black & Blue Tournament, 3rd Place, 100 Pts. Aruban Caribbean Cup, 3rd Place, 100 Pts. Orange Beach Billfish Classic, Heaviest Marlin 740.6 lbs, 500 Pts. Gulf Coast Triple Crown Winner, 250 Pts. Poco Bueno Fishing Tournament, Heaviest Marlin, 500 Pts. Texas International Fishing Tournament, Heaviest Marlin 687-pounds, 500 Pts. Texas Legends Billfish Tournament, 2nd Place, 300 Pts. Texas Women Anglers Tournament, 1st Place, 500 Pts. Poco Bueno Fishing Tournament, 3rd Place, 100 Pts. MBGFC Labor Day Invitational, 1st Place, 500 Pts. Cajun Canyons Billfish Classic, Heaviest Marlin, 699.3 lbs, 500 Pts. Cajun Canyons Billfish Classic, 2nd Place, 300 Pts. New Orleans Invitational Billfish Tournament, Heaviest Marlin 648.3-pounds, 500 Pts. MBGFC Labor Day Invitational, 2nd Place, 300 Pts. The White Marlin Shootout, 3rd Place, 100 Pts. The White Marlin Shootout, Heaviest White Marlin, 145.6-pounds, 500 Pts. Mississippi Gulf Coast Billfish Classic, Heaviest Marlin 796.9 lbs, 500 Pts. Blue Marlin Grand Championship, Heaviest Marlin, 795.2 lbs. Poco Bueno Fishing Tournament, 1st Place, 500 Pts. Lone Star Shootout, Heaviest Marlin 615-pounds, 500 Pts. Texas Billfish Classic, Heaviest Marlin 514-pounds, 500 Pts. MBGFC Ladies Day Tournament, 1st Place, 500 Pts. Texas International Fishing Tournament, 2nd Place, 300 Pts. Texas Legends Billfish Tournament, 3rd Place, 100 Pts. Poco Bueno Fishing Tournament, 2nd Place, 300 Pts. Texas Billfish Classic, 2nd Place, 300 Pts. MBFFC Ladies Day Tournament, 2nd Place, 300 Pts. Texas Billfish Classic, 3rd Place, 100 Pts. Texas International Fishing Tournament, 3rd Place, 100 Pts. MBGFC Ladies Day Tournament, 3rd Place, 100 Pts. MBGFC Labor Day Invitational, 3rd Place, 100 Pts. Jimmy Johnson’s Quest for the Ring, 1st Place, 500 Pts. Quest for the Crest Series, 1st Place, 250 Pts. Islamorada Fishing Club’s Sailfish Tournament, 2nd Place, 300 Pts. Dust ‘Em Off Sailfish Warmup, 3rd Place, 100 Pts. Gold Cup Team Fishing Tournament, 1st Place, 500 Pts. Pelican Yacht Club Invitional, 3rd Place, 100 Pts. Cheeca Lodge Sailfish Tournament, 2nd Place, 300 Pts. Florida Keys Gold Cup Series Champion, 250 Pts. Pelican Yacht Club Invitational, 1st Place, 500 Pts. Islamorada Fishing Club’s Sailfish Tournament, 1st Place, 500 Pts. Cheeca Lodge Sailfish Tournament, 1st Place, 500 Pts. Viking Yachts Key West Challenge, 1st Place, 500 Pts. Dust ‘Em Off Sailfish Warmup, 1st Place, 500 Pts. Fish Heads of Stuart “The Quickie” 1st Place, 500 Pts. Fish Heads of Stuart “The Quickie” 3rd Place, 100 Pts. Gold Cup Team Fishing Tournament, 2nd Place, 300 Pts. Jimmy Johnson’s Quest for the Ring, 2nd Place, 300 Pts. Viking Yachts Key West Challenge, 2nd Place, 300 Pts. Dust ‘Em Off Sailfish Warmup, 2nd Place, 300 Pts. Fish Heads of Stuart “The Quickie” 2nd Place, 300 Pts. Gold Cup Team Fishing Tournament, 3rd Place, 100 Pts. Cheeca Lodge Sailfish Tournament, 3rd Place, 100 Pts. Islamorada Fishing Club’s Sailfish Tournament, 3rd Place, 100 Pts. Jimmy Johnson’s Quest for the Ring, 3rd Place, 100 Pts. Viking Yachts Key West Challenge, 3rd Place, 100 Pts. Islamorda Sailfish Tournament, 3rd Place, 100 Pts. Kona Throw Down, 1st Place, 500 Pts. Overall Hawaiian Tournament Series, 250 Pts. Rock and Reel, 1st Place 500 Pts. Lure Makers Challenge, 1st Place, 500 Pts. Kona Throw Down, 2nd Place, 300 Pts. Capt. Mike Dakil, Miss Mojo, 600 Points. Rock and Reel, 2nd Place, 300 Pts. Lure Makers Challenge, 2nd Place, 300 Pts. Skins, 2nd Place, 300 Pts. BIMT, 2nd Place, 300 Pts. Capt. Kerwin Masunaga, Rod Bender, 500 Points. World Cup Blue Marlin Championship, 1st Place 760.5 lbs, 500 Pts. Wahine, 1st Place, 500 Pts. It’s A Wrap, 1st Place, 500 Pts. It’s A Wrap, Heaviest Marlin, 500 Pts. Capt. TBA , Silver Star, 300 Points. HIBT, 2nd Place, 300 Pts. Kona Throwdown, 3rd Place, 100 Pts. Rock and Reel, 3rd Place, 100 Pts. Firecracker, 3rd Place, 100 Pts. Lure Makers Challenges, 3rd Place, 100 Pts. Skins, 3rd Place, 100 Pts. HIBT, 3rd Place, 100 Pts.